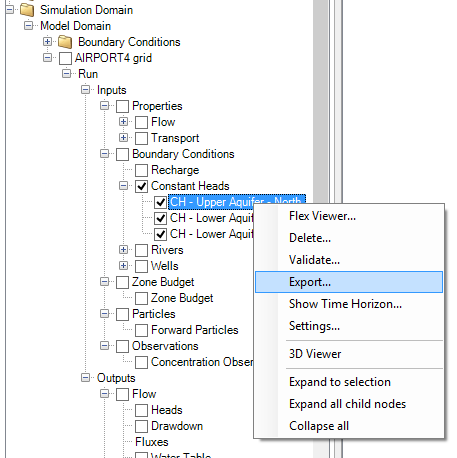 In certain cases, it may be helpful to export your boundary condition to a text file and make edits to the exported file and then import the boundary condition back into Visual MODFLOW Flex. You will be provided with a dialog to save the boundary condition as a .txt file. When working with regular (finite difference) grids, the format will be I,J,K while working with USG grids it will be ordered by ID. You can then make your edits within the .txt file and when you are done import the boundary condition back into Visual MODFLOW Flex. 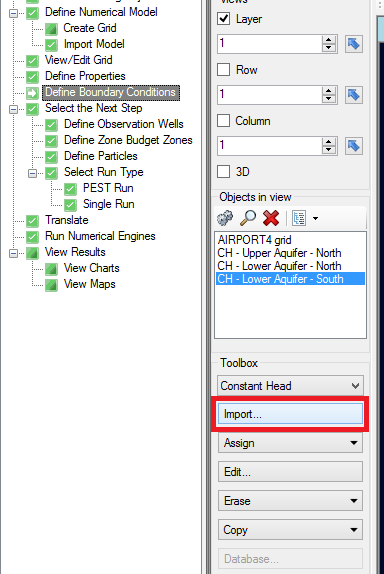 You will find the import option within the Numerical Workflow at the Define Boundary Condition step. Be sure to select the correct boundary condition type from the drop down before attempting to import the boundary condition file.